In cases where the front teeth have gotten involved, there is the additional embarrassment of a poor looking smile. Years of fear, embarrassment and shame take a serious toll on people’s self esteem and self confidence. This ‘cycle of fear’ makes it even harder to take the step of seeing the dentist. At Dr. Kurtzman’s Dental office we understand your fears and concerns. We know the realities of how you feel, we take them seriously and we are never judgmental or demeaning. We’ve been there… and we don’t like it either! Mild anxiety is very common. Nobody really likes having dental work done. Even small bad experiences can leave people nervous and anxious. In most cases of mild anxiety, the person is fairly clear about what they don’t like and how they wish to be treated. A calm and soothing environment, a caring staff, an attentive and patient dentist – as well as good local anesthesia (“Novocaine”) and sometimes a little bit of Nitrous Oxide Gas – are often sufficient to treat these people in the office. As anxiety and fear become stronger they cross into the area of “Moderate Anxiety”. Typically the person with moderate anxiety needs more than just “T.L.C.” and a mild anti-anxiety agent to have dental work. These people really cannot sit in the dentist’s chair and the stress on their system can actually be dangerous! Reduction of moderate anxiety to a point where the person can withstand dental care safely and easily often requires the stronger anti-anxiety agents used in Oral Sedation. With these procedures and good monitoring, the person with Moderate Anxiety can be treated in the dental office. The powerful and debilitating fear of dentists and dental work is often called Severe Anxiety or Dental Phobia. Dental Phobias do not respond to conservative techniques and these unfortunate people cannot be treated while conscious. Most often, general anesthesia in the safety of a hospital operating room is their best and only option for the care they want and need. Contact Dr. Kutzman today if you have a severe anxiety about going to the dentist. 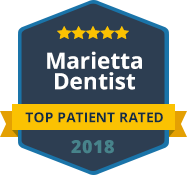 Call or contact our Marietta Dentist office to schedule an appointment. We look forward to working with you.